There’s something to say about monochromatic or semi-monochromatic cards, they are simple and yet artful. By using embossing folders you can give the card dimension. To break up the monochromatic style I used the Season of Style Designer Washi Tape (132155) from the Holiday catalog to wrap a 1-1/2 x 1-1/4 piece of card stock into a present and topped it off with Cherry Cobbler seam binding ribbon. 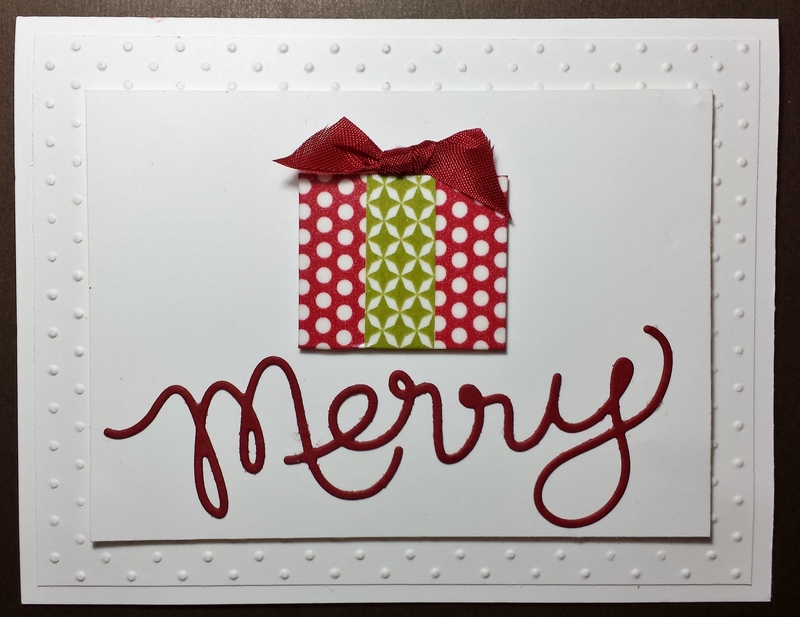 Now for the icing on the cake or the word on the card… I used one of my new favorite products, “Merry” from the Expressions Thinlits Dies (132171) also in the Holiday catalog. Any or all of these products can be purchased from online store or you can join my team for only $25 until Monday, October 21st! Happy Stamping and Create a Great Day! Shoebox Swap and Rubber Heads!